Hello I’m Sarah, and this my first year on FIRST Robotics team 1024, the Kil-A-Bytes. Since I have joined the team, I have learned many new skills like building, communication, and data collecting. In robotics I was put up to the task of learning scouting. At first I thought that scouting wasn’t for me, but I was persuaded that this job was one of the best ways for me to contribute to the team. 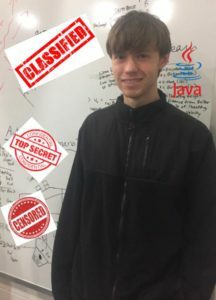 When I started looking at scouting I found that the team wanted to use a program called Tableau, which is provided for free to every FIRST Robotics team. This program helps people organize their data into charts and graphs, so everyone can decipher the information. Come to find out, my mom uses Tableau for her job! I have asked her for help teach me how to use this program, and along the way, I’m learning how to build up my own data collecting skills for the team. The tasks that I need to work on include identifying the man variables (what you want to measure) in the game. I also learned about writing down your variables and all possible ways to get them. Another task I need to work on is creating a format (scouting sheet) for the data. The most important thing I learned so far is that scouts need to understand the game and all of the components very well, because if you don’t you will never know where to start. I can’t wait to try scouting in the 2017 FIRST Robotics competition, Steamworks! I also wish good luck to all teams! 2017 marks the second half of my sophomore year in high school. In the fall and winter of my freshman and sophomore years I participated on the 1024 VEX team. Freshman year my team finished third in the finals of every competition we were at, while this year my team didn’t even qualify for the finals at the only competition we’ve been to. 2017 also marks my first year on the 1024 FRC team. Although I don’t know much of the programming language, I joined the programming team to hopefully learn more. Some major differences between VEX and FRC are obviously the programming language, size of the robots, the overall technical aspects of the games, etc. But more specifically I’d like to talk about how the team is structured. In VEX we split into 5-6 teams, each one building and working on their own robot. The team is still unified as one, but if pitted against each other at competitions we showed no mercy to one another. Meanwhile, here at FRC, we still split into different teams, but here it’s divided into building, programming, and design teams, all working together to make one robot. Overall I feel like FRC is a much more difficult challenge than VEX, in terms of both game complexity and robot design. In VEX, you use a select set of metal parts that you can bend and alter at your leisure, although you have to go off of what you start with and some pieces aren’t as customizable as others. Meanwhile in FRC you can more freely design and use your own parts, rather than have to use a specific set of parts. I also feel like there’s a closer bond between FRC teammates than there is between VEX teammates, what with the team dinners on Monday and Wednesday, and all teams needing to work together and communicate to accomplish one common goal. Also having a distinct time crunch with the build season lasting only a small handful of weeks gives us more of a drive to get things done as opposed to being unproductive for several meetings at a time. Overall I feel like the experience in FRC is more productive than VEX, as in VEX we only met two nights a week for two hours each, as opposed to four nights a week for three hours each. To anyone considering joining FRC in the future, I suggest you join your school’s VEX or VEX IQ team first, as they are both perfect entries into competitive robotics. Being on the robotics team has taught me a few things. If nothing else I learned that you can’t do everything by yourself. Even if you work on a project by yourself for years, you can’t do everything by yourself and expect to get results of the same quality as you would get by working with other people. Having a team is what enables you to get the job done quickly and effectively. I have also learned that everybody has their strengths. If you aren’t good at doing one job, that doesn’t mean that you can’t be successful in another area. You just need to find what it is that you’re good at, or even just something that you enjoy, and work to become the best you can be at doing that. If everyone is able to put their strengths together, then you’re able to accomplish some truly incredible feats. Conversely, even when everyone is working together, if nobody is doing something they know how to do, you won’t be as successful as you could be otherwise. 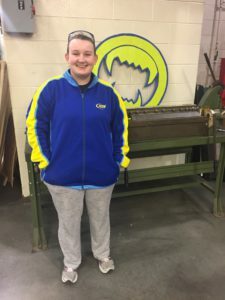 While working as a member of the team, I have been able to experience first-hand what it’s like to be in a career in manufacturing. I may not work on the design of the robot myself, but I am working on the programming that will allow the robot to work properly when it is done being built. Everyone has their own part to play on the team, and without each other, we would never find success. On July 16, 1969, the American flag heralded the launch of Apollo 11, the first Lunar landing mission. The massive Saturn V rocket lifted off from NASA’s Kennedy Space Center with astronauts Neil A. Armstrong, Michael Collins, and Edwin “Buzz” Aldrin at 9:32 a.m. The mission was the first successful run of mankind going to the moon and back. It was all run on just 4 kilobytes. In 1973, Gary Kildall wrote CP/M , a simple “Control Program/Monitor” that was used for an 8-bit Intel 8080 microprocessor. CP/M ran on approximately 3.5 kilobytes. Then in 1980, Shigeo Funaki, Toru Iwatani, and Toshio Kai created one of the most well known video games known to date, Pac-Man, using just 4 kilobytes. If only this small amount of memory was used to do all these great things, then imagine what a full team of Kil-A-Bytes can do…. Kil-A-Bytes work together to build robots, but we also do so much more. Kil-A-Bytes foster collaboration with students, mentors, and STEAM professionals. Kil-A-Bytes encourage excellence in individual achievement, communication skills, and competition. Kil-A-Bytes empower respect for others, growth in self-confidence, and leadership skills. Kil-A-Bytes inspire the next generation of engineers. As the leader of the programming team, I am in charge of making sure that the robot moves. What we have been working on for the past 3 weeks is camera vision. We have been making sure that we are getting the data, and that it is the correct data. This isn’t just a plug in a camera and you’re done. You have to write code that selects how you even interface with the camera and what image properties you want the camera to give you. We also worked on prioritizing auto routines. We found out that there were around 200 combinations of autos that could be made. We had to narrow that down to five different auto routines. We analyzed how difficult it would be to pull it off, and how useful this auto would be to us and our alliances. We then set up those five routines and set deadlines for them. Now, there are five concepts, but there are still multiple versions based on different circumstances. Looking ahead, I see this as the hardest programming challenge that we have been faced with, but I am looking forward to seeing all the hard work pay off. As the third week of build season begins, the functional systems teams presented their concept review presentations to the rest of the team. As a student lead, I was in charge of leading my group’s design presentation. Any concerns that other team members had about our designs were voiced and answered. Some questions that were asked included, “What gear ratio did you use?” “What speed will that system be?” “How much space does that mechanism take up?” “Will that be an automated process using cameras/sensors or will it depend on driver skill?” Now we will begin to finalize our ideas and create 3D models of them using Autodesk Inventor. Next Saturday we will present our final design reviews for our systems to ensure that everyone on the team is happy with them. As each systems team creates their 3D models we realized a possible issue is system integration. System integration is the capability for our different robot components to come together and still function properly. A major issue we are facing is the size of our systems. We have a lot of components that take up substantial space, so we have to figure out how to package all of our systems together. Because of these concerns, as a team we must consider the possibility of changing our designs/plans so that all of the systems will fit together. This may take compromising on designs, which is why it’s so important that we develop a priority list early in the season. The second week of build season has been going strong here in the 1024 workshop. We’ve all worked so hard on our designs and prototypes, and we won’t let up until the end of week six! I am co-lead on the “ready for takeoff” team with Emily M. She takes most of the weight on her shoulders, I must admit. However, we have all been working our hardest to make this year even more successful than the last! Currently, our little Mötley Crüe is working on the design review for our different climbing mechanisms. The climbing team is working hard on CADing the end design of our climbing mechanism. We’ve had some design ideas that work much better than we had thought, and some ideas that could have worked but aren’t the most practical. Some of the ideas were brought to life after the much needed information on the types of rope allowed was released. Since then, Emily and I have been pushing the schedule for the end prototypes to be completed. With a little diligence, we’ll be ready for takeoff at Tippecanoe! As week two of build season gets going, the functional systems teams are beginning to work towards their concept reviews, which will explain in detail the different ideas and concepts that they have brainstormed for their sub-systems. As the student leader for the shooter system, I need to make sure that we have our prototype tests nearing completion, and that those tests have been documented and are ready to present to the team at the end of the week. We have narrowed down our ideas to one specific type of shooter, and are currently changing small details and features to get the best results and finalize the design. Soon we will begin putting together our presentation so that we can clearly communicate and present our design to the large group. During this whole process, there are other factors that need to be looked after than just meeting deadlines. While an important part of being a student leader is making sure that my group is being productive and staying on schedule, another vital part is ensuring that every member of the team is staying engaged and learning during the entire process of designing and building the robot. 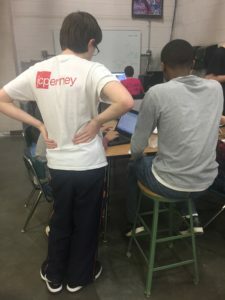 Learning the skills needed to be successful in a team setting and in the STEM world is a significant part of being on an FRC team, so as a student leader I need to be working to help the other members of the team learn those important hard and soft skills. It’s also great experience for me, as it helps me to gain valuable leadership skills that I may utilize in the future. I’m looking forward to seeing how the Kil-A-Bytes use these skills to launch a successful 2017 season! It has been one week since kickoff and we have many decisions made already. I am the student leader working on the robot chassis. 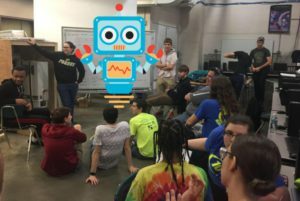 This past week the chassis team had to make several decisions about the robot. Decisions like inspection volume configuration we are going to use and why. Also what wheel size to use, what gear ratio, and many others. Today we gathered the entire team together and we talked them through our decisions. We also answered their questions as to why we chose what we did. We do this so the entire team understands our decisions, so we are all in agreement, and the other groups know what we are doing. Like I said before I am one of the student leaders on this team. This is not just a title or privilege. It is like a job. We don’t just get to tell everyone what to do; we have to lead by example. We have to make sure all the other students are following the proper rules and being safe. If someone doesn’t have a task, we need to help them find something to do. It is not always easy, but it is good experience for the future. It feels good to know that I am doing something beneficial to the team. I am feeling great about this season and am excited that this game is the one I go out on. After my leave of absence for marching band in the Fall, I’ve come back to the shop to discover it clean and more organized than it’s ever been (at least in the time I’ve been here). Now with the 2017 season started, and my senior year is in the last stretch, I’m taking leadership on the team, and I’m the only female student leader. There are six leaders on our team and only five groups, so I have been grouped with another leader and we are working on a climbing mechanism. Being a team leader is something that I’ve wanted to do since I joined as a sophomore. When I first joined, my specialty was scouting, and still is, but I’ve learned so much more. Being a team leader means having enough experience to lead, the skills to build, and being flexible with the situations presented. It’s really fun being a team leader, I “know the ropes” better than the newer members, and I’m here to help as much as I can. 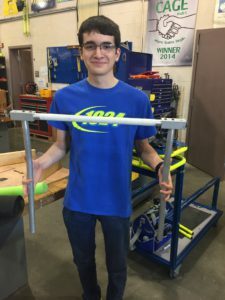 Since our team did not scale the tower last year, we are determined to be ready for flight this year, and one of our mentors challenged us to have a working climber by the end of the first week! We have two ideas that are being worked on, and the group is divided between the two. My group has progressed further than the other group. Our first prototype has proven to have some merit, but much improvement is needed. This climber will be working by the end of the week.